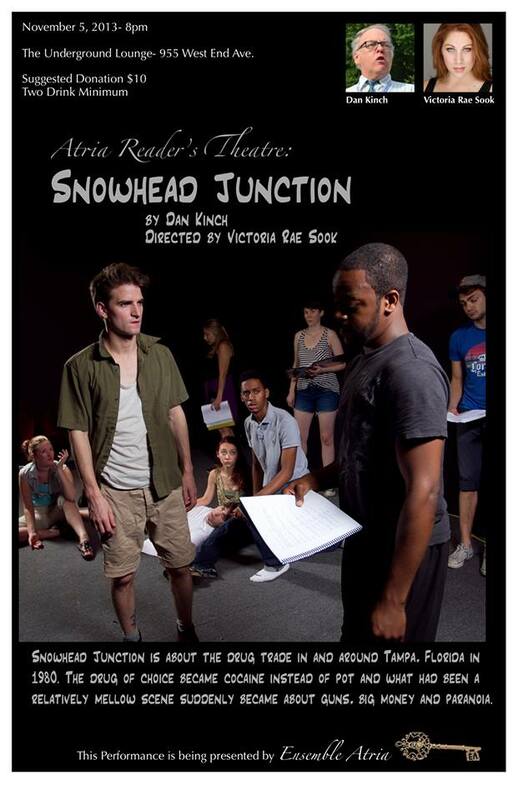 The poster from my upcoming gig for my play SNOWHEAD JUNCTION. A long time ago in a gallery far, far away I was a college student in Florida. It was in that weird part of the late 1970’s when just about everything was up for grabs. The cynicism about the government’s lies (between the JFK conspiracy theorists and the Watergate Reality theorists) was borne out by the Church Committee hearings of the period, which gave rise to every previously-held truth being up for re-examination. Iran had unwound into a theocratic country with profound hatred of the US for its support of the Shah. When the US embassy was taken over, the papers retrieved revealed the degree to which the US had supported repression of human rights in the country and had participated in the coup that got rid of the elected leader Mossadegh. On a personal level, the waiting-tables day job I had to keep me in school was dependent on rich tourists with big money to tip; the Iranian oil embargo put a big crimp in disposable income, and that in turn meant it was harder and harder to split my money between school and books and the car I needed to haul back and forth from job to same. It was also a time when spending big money on cocaine became a STATUS SYMBOL. Even college students were starting to use. I was pretty close to abstemious on pot and coke, but you couldn’t avoid drugs in Florida back then. I went home to NJ at one point and a local high school bud was throwing a get-together. I was gobsmacked at the way the folks there hid drug use–people were really secretive about it in a way that many of my peers in Florida were not. And there was an economic underpinning to drugs in Florida. People didn’t make enough to cover the rent if they were in tourism or ‘hospitality’, so they sold the occasional bag of dope. And as the economy squeezed after 1979 and cocaine became more widespread, people started selling that, too, and for a much bigger profit margin. All of this is preamble to introducing my play SNOWHEAD JUNCTION. It’s not dissimilar in style to all those lovely single-set Lanford Wilson ensemble pieces that theatre students were reading back then. It has a passing resemblance to that old hoary HATFUL OF RAIN, a ‘kitchen sink’ play (later made into a movie) that made high school students laugh about heroin addicts in the 60’s (Jack Gelber‘s famous play about heroin addiction, THE CONNECTION, specifically calls out HATFUL OF RAIN for its vapid dialogue right at the top of the show). What separates my play from others in such style is the subject matter. The dialogue has a dope/cocaine-infused snap to it. And it says something about plain old working class ‘Muricans putting their hopes for the future into selling drugs–too often we get plays and movies about drugs that are engaged in judgment of those who got swept up in that lifestyle. Also, so much of our media is about FOREIGNERS and drugs. What was happening in this time period was largely homegrown. SNOWHEAD JUNCTION is about that weird time juncture in Florida around 1980 when things stopped being mellow. There was a sea change in the world when cocaine became a drug of choice–all those stories about people keeping pot plants on their porches went away, and the people who had cocaine started buying big f*cking guns and ripping off their friends. There’s that weird moment when people moved from DUDE WHERE’S MY CAR to SCARFACE. And that’s what I tried to capture. Somebody read my play and saw these things (I hope they did, anyway) and thinks it deserves a venue for reading. So if you’re not busy on TUESDAY, November 5 at 8 PM, Drop by the Underground Lounge at 599 West End Avenue to see a reading of SNOWHEAD JUNCTION. This is under the sponsorship of Ensemble Atria, a performing Arts company here in the city with a great ensemble of young actors. I got the good news a few days ago from Victoria Rae Sook, the artistic director. So drop by the Underground Lounge a week from Tuesday. There’s a suggested admission of $10 and they want you to have a couple of drinks (you are being called on to consume drugs in the form of alcohol to pay for a play about drugs of other forms, though I’m told that they also serve up food and non-alcohol fare). I have great respect for the work Ensemble-Atria is doing and I’m hoping this is the beginning of a long-term relationship. And if you lived through this period, I’d like to have your feedback.